Geila Hocherman‘s blog made it’s very promising debut yesterday featuring a recipe for incredibly delicious blintzes, thus I was inspired to look for alternative recipes from cultures other than my own or Geila’s Eastern European one. I wanted something different, or at least a different way of making the equivalent of traditional Ashkenazi blintzes. For many years I’d heard of Syrian ‘Atayef and finally I found a recipe in Poopa Dweck‘s Aromas of Aleppo. ‘Ataiyef is not your ordinary Sunday morning pancake. 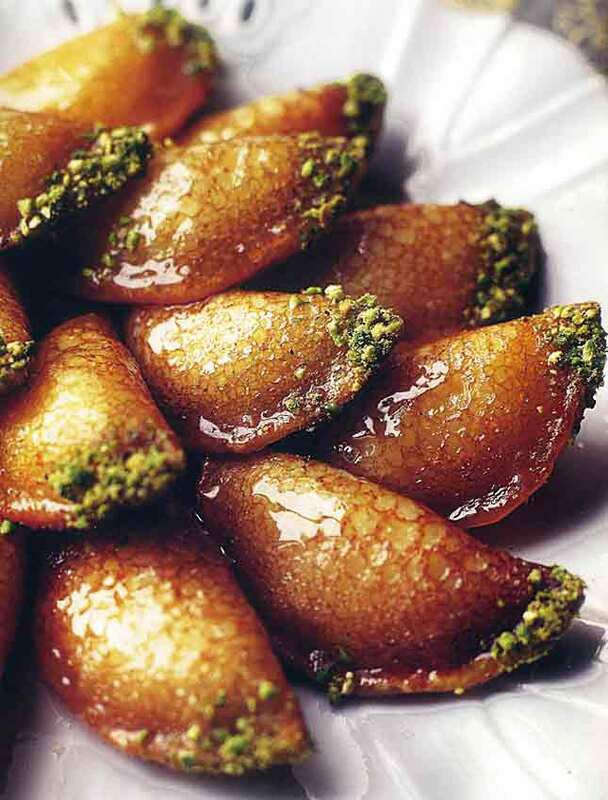 Filled with ricotta cheese, deep-fried, dipped in chopped pistachio nuts, and topped with shira (Fragrant Aleppian Dessert Syrup), it is more like a five-star dessert. 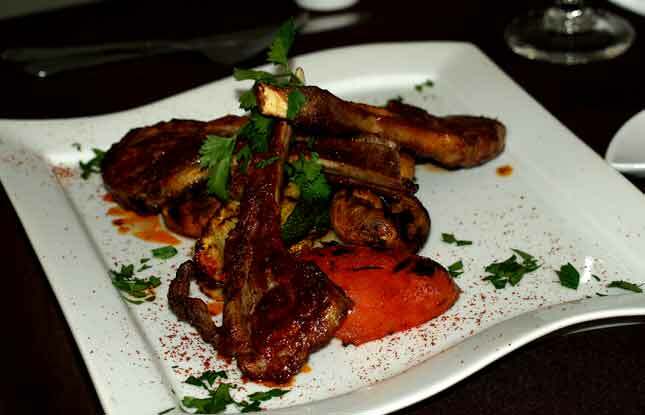 Aleppian Jews eat ‘ataiyef on happy occasions such as engagement parties. these pancakes are one of the dairy foods customarily eaten during Shavuot (feestival of the giving of the torah). King Solomon’s “Song of Songs,” particularly the words “honey and milk are under your tongue,” inspired this dish. the sweetness of shira shares a symbolic connection with the sweetness of Torah, which the Jews received on Shavuot. ‘Ataiyef is also served on Hanukkah because it is fried, and thus symbolizes the miracles of oil celebrated on that holiday. While this recipe offers a way to make the batter from scratch, you may find commercial pancake mixes more convenient than homemade. Preheat a griddle pan over medium heat. wipe the pan with a paper towel dipped in vegetable oil. Combine the flour, baking soda, sugar, baking powder, and salt in a large mixing bowl. Add the eggs and 2 1/2 cups water to the mixture. Stir the mixture until the batter is smooth and there are no lumps. Make the pancakes by pouring water, 1 tablespoon at a time, onto the griddle. Shape the batter into 3-inch-wide pancake, much like a thin crepe. cook on one side only. remove the pancake, when bubbles appear on its surface. keep the cooked pancakes by covering them with a clean towel. In a medium saucepan over medium heat, heat the vegetable oil until it sizzles upon contact with a drop of water. Deep-fry the filled pancakes in batches for 3 minutes, or until brown. Coat the fried pancakes in the cold shira. Dip the point of each pancake in pistachio nuts. To ensure a crispy texture, place the pancakes on a tray in a single layer; do not stack or cover them. For a non-dairy version, combine 2 cups firmly chopped walnuts, 1/2 cup sugar, and 1 teaspoon cinnamon and substitute for the ricotta. This simple syrup is a component of so many Aleppian desserts that it is a fixture in Aleppian refrigerators. 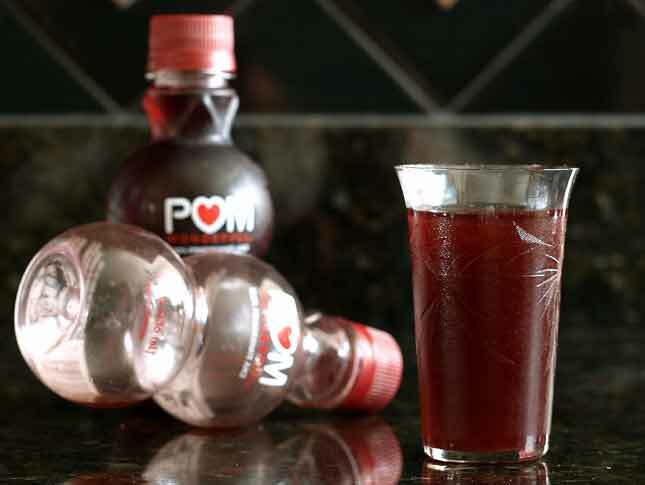 The addition of rose or orange blossom water imbues it with an exotic flavor for which the Middle East is renowned. When preparing shira, it is important to get the right consistency. For some Syrian sweets, a thicker syriup may be necessary. To thicken the syrup, keep it on tn the heat a a bit longer; if it is too thick, add some water and simmer again. when pouring shira over hot pastries, the syrup should be cold so the pastries stay crisp. Combine the sugar, lemon juice, orange blossom water, and 1 cup water in a medium saucepan over medium heat. Stir constantly with a wooden spoon until the mixture boils. Reduce the heat to low and simmer for 15 minutes, or until the syrup slides slowly down the back of a spoon. Allow the syrup to cool. use immediately or pour into a glass jar and refrigerate. it will keep for up to2 months. 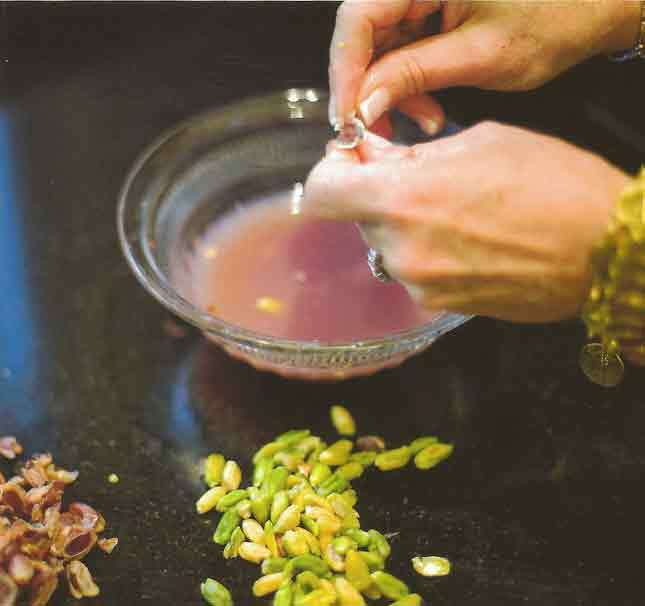 All helou recipes use orange blossom water, rose water is used for other sweets. The tin, edible skin of the pistachio can easily be removed from the nut by blanching it. Cover shelled pistachios with boiling water and let them stand for 4 to 6 minutes, then peel off the skins. Enjoy, gentle reader, enjoy! I most certainly will… my mouth is watering already. This is one of our Moroccan favorite dishes, a sort of comfort food for ex-pats and honorary Sephardis alike: See how they mop that sauce with their bread! Shakshuka is nothing more than Matbukha with eggs scrambled into it and served as a main course, and gets its funny name from the Arabic word for “scramble.” Sometimes tomatoes get too expensive; in this case, it would be OK to use canned diced tomatoes. Slice about ¼ inch off the pointed end of the head of garlic, leaving the cloves exposed. Drizzle the olive oil onto the garlic and the peppers, place them on a cookie sheet, and roast for 30 minutes, or until the garlic is soft and the peppers are charred (the peppers might be ready a few minutes before the garlic). Press the cloves out of their skins while still warm and mash with a fork. Peel the peppers and cut them into thin strips. 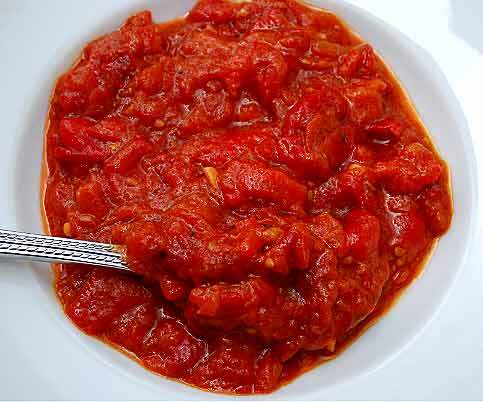 In a heavy wide-bottom pot, bring the tomatoes, oil, and paprika to a boil. Reduce the heat to medium, add the roasted garlic and peppers, and cook covered for about 30 minutes, stirring frequently. All of the water should evaporate, and the oil will resurface (if you neglect this step, you will not get the desired look and texture but a glorified tomato sauce). Add the freshly minced garlic and the salt and pepper to taste. 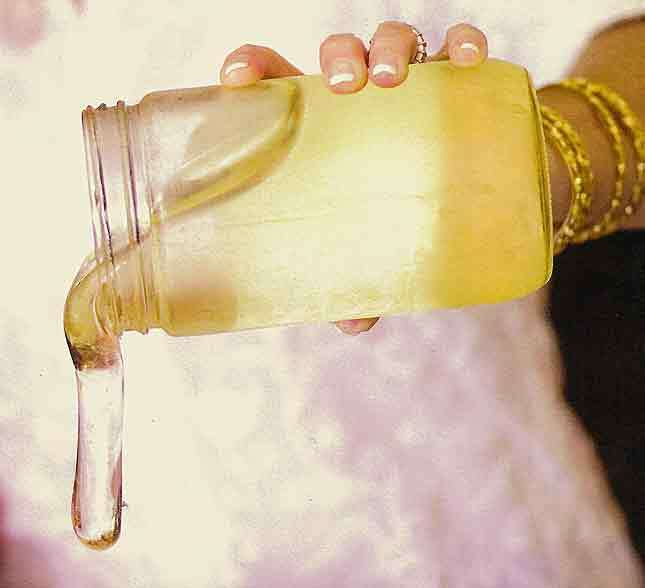 Let cool and store in a glass jar in the refrigerator. Use a slotted spoon to serve so the oil stays behind. This will keep for up to two weeks. Stir 8 eggs into the Matbukha, mixing thoroughly with a wooden spoon, and cook just a few more minutes until the eggs are barely set. If you would rather end up with a more pristine look, leave the eggs whole, break them one by one, and set them over the mixture, close but not touching, and cook covered on a low flame until they look barely set. 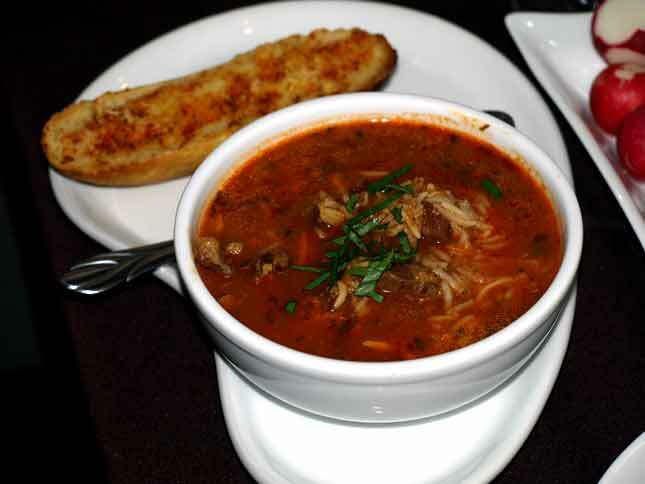 Serve hot, alone, or with a good whole-grain bread, or on a bed of cooked (canned OK) white beans (except on Passover!). How time flies! When we started (on November 2nd, 2009) we were not sure if we’d still be blogging a year later. Would we get any regular readers? Would anybody really be interested in our thoughts? Could we say something, could we sound different, from far more established bloggers and existing websites? A 171 posts and a later later, we realize our hopes are slowly materializing. Most of the exhibitors we spoke to, at last week’s Kosherfest, had heard of us; an impressive number of them had actually seen and read these pages here and abroad. We constantly meet people who follow our musings regularly. As beginning bloggers, who wondered for how long we would be able to post once or occasionally twice a week, we suddenly find a lot of material that interests our readership. We’ve been told our writing styles are refreshing, our photography mouth watering. Even non-Jewish publications and blogs have noticed us. But I must confide in you, IF we are any good at what we do it is only because we love our subject matter… we are foodies! During this past year, we’ve sampled some of the top kosher eateries, (from Chinese to Middle Eastern cuisine, from Japanese to French, to Italian, to American, to Fusion, we’ve tasted them) met some amazing chefs – people full of creative energy and an uncanny understanding of the nuances of flavor. We’ve learned and continue learning a lot, about food, about wine; above all, as we forge new relationships with chefs, with restaurateurs, with manufacturers of kosher products, with cookbook authors, with winemakers around the world, etc., we are often told personal stories that prove that even those who excel at their craft are just humans like the rest of us. What drives them to succeed? What fuels their drive? Simple, it is their passion for food, their passion to prove that kosher need not be a second class cuisine. Yes, cooking kosher, manufacturing kosher products, may be a bit more challenging… but, it is precisely those challenges that spur them on, that excites their creative juices. Kosher has come a long way!!! But what SYR and I are most grateful for, gentle reader – what helped us the most – were your suggestions, your words of encouragement. What lies ahead is exciting, we plan many a contest for this upcoming year and are at this very moment negotiating the prizes. We plan on bringing you guest posts by well known Chefs, as well as outstanding recipes from professionals and from housewives who almost daily improve, create, or adapt delicious new dishes. We will also bring you reviews of amazing new products. And, of course, we will continue to review kosher restaurants and often we will write about our revisits to favorite eateries. Our first year was productive and we are proud of how we grew, but there is so much more to accomplish. Thank you, gentle reader, we could never have gotten here without you. Drizzle about 3 Tbs of olive oil on a cookie sheet and pre-heat sheet in a 350 degree oven. Peel and slice eggplant, 1/2″ thick, sprinkle with salt, and bake in a single layer on cookie sheet till soft. 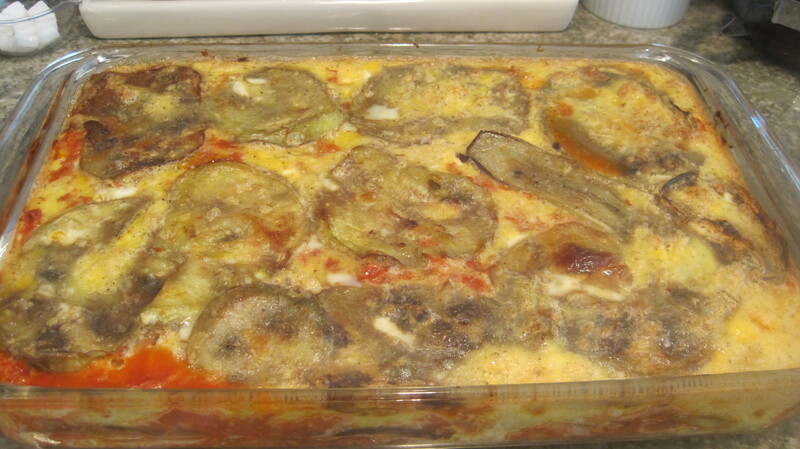 Turn eggplant slices over and bake other side. (you can fry the eggplant if you prefer but this is a much lighter version) Heat 3 Tbs olive oil in a large heavy pot and add 4 finely diced onions. Saute till golden. Add ground chicken, ginger, garlic, turmeric, cumin, paprika, and salt and pepper. With a wooden spoon, continue breaking up ground chicken till seasonings are incorporated and meat is lightly browned. Add tomato sauce, tomato paste, and cilantro to chicken mixture and cook for about 20 minutes over a low flame, stirring frequently. Grease a 9 x 13 dish and cover the bottom of the dish with half the meat sauce and add a layer of eggplant. Repeat this so that you end with the eggplant on top. Beat 6 eggs and pour over dish. Bake about one hour, uncovered, in a 350 degree oven. SYR just told me she’ll make this dish tonight for dinner, hmmmnn… I just hope she’ll be kind enough to let me taste the leftovers tomorrow. I always made moussaka with lamb, this one should not only be cheaper but the difference in taste will be a welcome variation. Enjoy! Yesterday afternoon, I passed by Sason Grill and the aroma emanating from the place (I’ve been blessed, or cursed, with a very strong sense of smell) suddenly made me hungry. 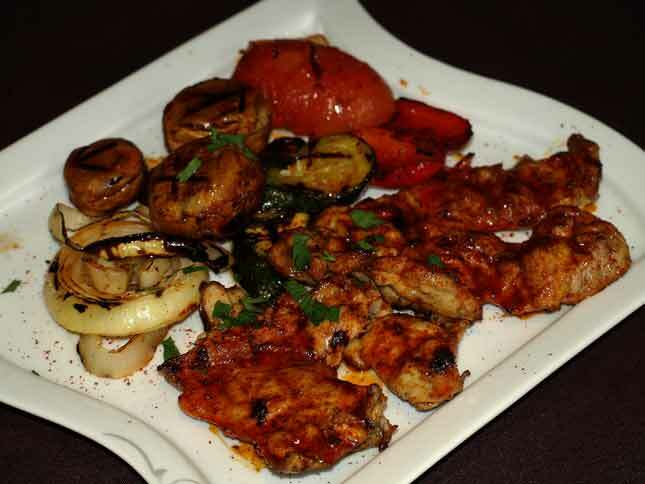 It’s a tiny place, located on a side street off Brooklyn’s Avenue J (1012 East 15th Street; Brooklyn, NY 11230; Tel: 347.307.6647; under the hashgocho of Kehilla Kashrus), off the main street and very easy to miss. It looks extremely unpretentious, hardly enticing, but… don’t let appearances fool you! Their menu includes only four items: Shawarma, Schnitzel, Falafel, and Hamburger. I ordered a Shawarma Sandwich Platter. The shawarma, made from fresh baby chicken meat, was very juicy; spiced liberally to give it that Middle Eastern flavor of cumin, etc, it was unusually delicious. I got a selection of the three house sauces: chimichurri, olive and tehina. All three made fresh in-house. The best part about this unexpected feast was, surprisingly, its low cost. Though it certainly lacked the presentation I’ve become accustomed to, it more than made up for it in flavor. I know I’ll be back again and again. Next time, I’ll even bring SYR with me. Olympic Pita(58 West 38th Street; New York, NY 10018; Telephone: 212.869.7482), provides proof positive that a restaurant in Manhattan can provide good, wholesome, food without being expensive. I was there on a recent Sunday and the presentation was simple, the taste very good, the atmosphere warm and inviting. I started the meal with a very unusual sushi roll, Sabich… It consists of hard boiled egg, pickled cucumbers and eggplant. No fish of any kind! 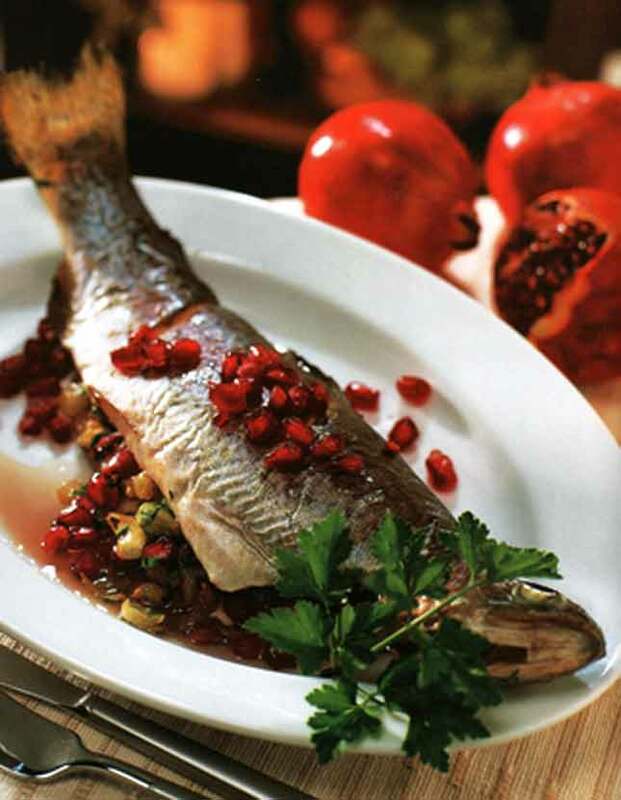 Very tasty and imaginative adaptation of a traditional Iraqi dish. I also had their 5 Sampler Mezze, it included israeli salad, fried eggplant, tabouli, Moroccan carrot and matbuha. Each of these was excellent. I followed with a Beef Eye Steak. It was tender, juicy, somewhat smoky and absolutely delectable. I also had their Shawarma, which comes wrapped in rice and paper to look like a pair of exotic flowers. These two were succulent. I also had an Iraqi Style Beef skewer. A very aromatic ground spiced beef, nice tasting, tender and juicy. I also had the in-house Lafa (an oversized, thin pita) which I managed to photograph while baking. There, on the left side wall is mine. I got it piping hot! Those middle easterners know what’s good! I washed it all down with a glass of very good red house wine. Though it is located in midtown Manhattan, the prices are very Brooklyn. 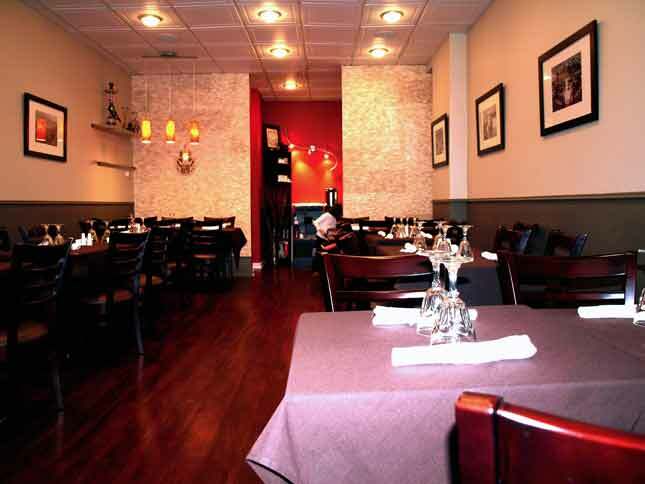 The food was unpretentious, but the quality, the taste, went far above their price range. No fancy French or Italian names here, merely standard Mediterranean and Middle Eastern fare. I will most definitely be back.